The space probe that NASA launched recently has sparked some interesting comments. And I'm not saying I always knew that but srsly, I always knew that. See also, "Europa" by J.A. Sanderlin. I tweeted this one when I got it the first time but I think it bears re-blogging the tweet. This is just cool stuff and I'm putting it out there so maybe one more person can take a peek. The Kennebec Journal printed an opinion post about that which I have been raving about for some time now. And since I agree with it, I'm posting the link here so you can read and agree as well. And let me just say once more AMEN. Another upside to brown outs (can't remember what any of the other positives might be just now) is that you can see the night sky better. I wonder if they'll ask me what I think? Doubt it. But hopefully it will bring more press to the book & to space exploration in general. 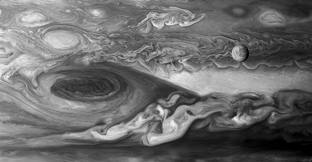 Live pictures of Europa you say? Got em right here! You have to look pretty hard though but beggars ... etc. ...to whom, I don't know. But it has gotten away from me this past month. I have been furiously working on a new project that I hope everyone will enjoy and as usual I'm only going to drop a tiny hint of what it is about: concept art. Okay that was a big hint. I'm looking forward to getting some visual references out there for people and heck myself too! Hope to have this project wrapped up by the end of the year. If there are any artists out there who are interested, send me a Europa concept sketch or other work and I will certainly consider you for the project.